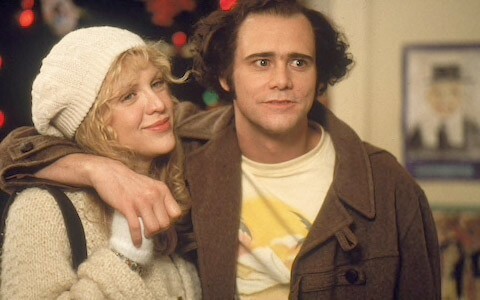 COOL COUPLE Jim Carrey plays Andy Kaufman and Courtney Love plays Lynne Margulies, Kaufman's longtime girlfriend, in Man on the Moon. When it comes to method acting, how far is too far? Jared Leto reportedly sent dead rats and used condoms to his co-stars during the making of Suicide Squad. It's sad when such "dedication" results in an arguably subpar performance that's easily outshined by previous Joker interpretations (do you think Heath Ledger's take would have been any richer had he left a flaming bag of poop on Christian Bale's doorstep?). Man on the Moon is the only Andy Kaufman biopic to date, so there are no other Kaufman performances to compare with Jim Carrey's. What Carrey delivers is very good, but not something I would have guessed he stayed in character 24/7 for. But after seeing the behind the scenes footage in Jim and Andy: The Great Beyond, a new Netflix documentary on the making of Man on the Moon, I can't say I would have wanted Carrey to approach the role any other way. I was eager to re-watch Man on the Moon, which I'd seen a few years ago, after enjoying The Great Beyond so much. I fear my expectations were a bit higher than they were back then. Apart from the fact that you won't know whether you're watching Carrey or Kaufman's twin brother half the time, there isn't much to discern Man on the Moon from any standard run-of-the-mill biopic. The film opens with a young Kaufman, a struggling comedian, doing his now-famous Elvis impersonation at a New York nightclub. But his luck changes when he's discovered by talent agent George Shapiro (played by Danny DeVito, who co-starred with the real Kaufman on Taxi). We follow Kaufman on his journey to stardom and back to obscurity, from his first Saturday Night Live appearances, to his infamous stint as a "professional wrestler" and his brawl with Jerry "The King" Lawler (played by himself in the film). Speaking of people playing themselves, the film is full of them. Judd Hirsch, Christopher Lloyd, Carol Kane, David Letterman, and Lorne Michaels all make appearances. As for those who don't play themselves, Courtney Love and Paul Giamatti stand out above the rest. Love plays Lynne Margulies, Kaufman's longtime girlfriend, and Giamatti plays Bob Zmuda, Kaufman's best friend and writing partner. Man on the Moon reunites director Milos Forman (One Flew Over the Cuckoo's Nest) with Scott Alexander and Larry Karaszewski, the writing duo behind Foreman's The People vs. Larry Flynt. Teaming up the director of Amadeus with the writers of Ed Wood sounds like a match made in biopic heaven, but somehow Man on the Moon gets stuck in limbo.